Dear Miss Lonelyhearts: Can I ride a motorcyle in the Peace Corps? "No PCV ANYWHERE can operate a motorcycle unless it is a life/limb/sight emergency. Some PCVs in certain places are allowed to ride motorcycles if no other transportation is readily available...some Cameroonian PCVs and a lot (maybe all) Beninois PCVs have that privilege. Peace Corps provides them with motorcycle helmets. For most PCVs world-wide, riding a motorcycle is grounds for immediate administrative separation due to the HUGE safety risk. I cannot tell you how many motorcycle accidents I witnessed as a PCV in Chad. Bad ones too. Some volunteers choose to risk being ad-sep'd and take motorcycles, but it really is a pretty big risk." Read more. 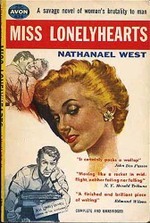 Dear Miss Lonelyhearts: How did 'Kumbaya' become a mocking metaphor? An extensive (and we do mean extensive) search of databases of newspapers, magazines and other sources turned up what may be the first ironic reference to "Kumbaya" in print, from Aug. 16, 1985. The line is from a Washington Post review by Rita Kempley of the comedy movie Volunteers: "Tom Hanks and John Candy make war on the Peace Corps in Volunteers, a belated lampoon of '60s altruism and the idealistic young Kumbayahoos who went off to save the Third World." How did she settle on "Kumbaya?" Had she heard others mocking it? Was it something about the cynicism felt by liberals under Reagan? A commentary about the religious theme of the song, at a time when the Moral Majority was making its name? Ms. Kempley can't remember. "I guess that song was the ultimate expression of people in the '60s who really cared," said Ms. Kemply (who accepted a buyout last year from the Post). "And then everyone decided, Let's just make fun of that." Read more. Dear Miss Lonelyhearts: Has anyone had issues with blogs or personal websites in the peace corps, or do they really only care about what you say about them? Here is PCs official blog policy, garnered using the FoIA: http://peacecorpsjournals.com/rules.html. It's basically "you're welcome to maintain a blog/personal website, but you should do so with cultural sensitivity, discretion for private information/etc/etc". They don't care if you have a blog/website, but if you do, they want to know about it, and they want to make sure you're well, playing nice. Peace Corps maintains that it owns everything you create, write, design, or communicate during your service. They also maintain the right to kick you out if you reveal too much information about where you are posted, your work, etc. Read more.